When is the laundry Open? What does last wash mean? When I drop-off my clothes for the Wash & Fold service, do I need to separate my clothes first? I don’t want my clothes folded - can you give them back to me on hangers? What if I have special instructions for the care of my clothes - i.e. - new clothes, fear of shrinking, etc? What if I can't pick them up right away - how long will you hold them for me? What if something is damaged or lost? Can I drop off bedding as well or just clothing? How much can I fit in one machine? Can I wash bedding or rugs in the machines? When is an attendant present? Do you really dry in one cycle or does it take 2 or 3 cycles to dry? What if a machine breaks during my usage? Do you sell merchandise in case I forgot my laundry product, etc.? 1. When is the laundry Open? 2. What does Last Wash mean? Last wash means the time that a person can start their wash. Of course you are allowed to remain until your clothing is dried and folded. 3. When I drop-off my clothes for the Wash & Fold service, do I need to separate my clothes first? There is no need to separate your colors and whites we will do that for you. You should, however, be sure that your socks are not balled up, and that there aren't clothes inside of clothes, such as two shirts that you took off together, or shorts and sweats that came off together. These oversights will prevent your clothes from getting their cleanest. 4. What about sweaters, delicates? Unfortunately due to time pressure we cannot wash or dry items individually or hang dry them. If you have items requiring special washing or drying treatment you should not include them with your order. 5. I don’t want my clothes folded - can you give them back to me on hangers? We will do your order any way you like. Maybe you have t-shirts that need to be folded and polo shirts hung. Just let our attendant know. There may be an additional charge if you request all your clothing to be hung. 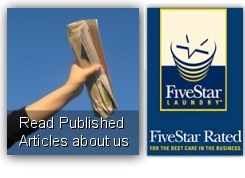 Our goal is to make sure your laundry is ready to wear or put away the way you want it to be. 6. What if I have special instructions for the care of my clothes - i.e. - new clothes, fear of shrinking, etc? All special instructions need to be given to the attendant at the time of drop off. If you have a particularly fragile or delicate item you should consider hand-washing it at home. 7. How do I know that I am getting all of my clothes back? We wash and dry and fold your clothing by itself, never with another order. Your order is recorded when complete with number of pounds and recorded so our attendants can easily find the exact number of bags you left us. If by chance items are missing please call our customer service number immediately so we can begin to search. 8. Will my clothes be mixed in with other people's clothes? No, never, won’t happen. We wash, dry and fold each clients clothing separately. So you don’t have to worry about your garments mingling with the dirty neighbors garments. 9. How do I know when my clothes are done? Right now we tell you it will be done the same day if you drop off before 9am weekdays. If you drop off on weekends there may be a one-day wait due to heavy weekend volume. There are times that we can do things quicker than that. You can ask our attendant or just call the store and ask the attendant if your order is ready. Just give them your order number (on your ticket) or last name. COMING SOON! We will be able to either text message or e-mail you a confirmation that your drop off and or Dry Cleaning order is ready. 10. What if I can't pick them up right away - how long will you hold them for me? Winter Break, fall break, Spring Break we know you like to get away and sometimes are in a rush. We will hold your completed clothing for 30 days during that period we will attempt to call you. 11. What kind of detergent do you use? 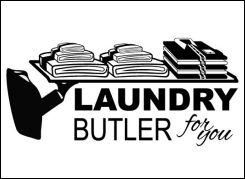 All of our orders are done with a name brand detergent, fabric softener and dryer sheets. We also use an oxi-bleach (non-chlorinated so it wont fade colors) to give your clothing the extra brightening you deserve. 12. If I use a special detergent - can I bring it in to you and have you wash with that? Of course, many of our clients are allergic to the stronger name brand detergents or just prefer a certain kind. Just bring a cup or two of your detergent and let our attendant know. 13. What if something is damaged or lost? If you are missing an item please call or email customer service within 5 days of picking up your clothes. We will attempt to look for it and work with you on solving the problem. 14. Can I drop off bedding as well or just clothing? Sheets, towels and pillowcases are charged on our regular per pound plan. Comforters are priced differently. Non-down comforters are charged at $15.00 up to Queen size, $18 for King; and down comforters are $25.00 up to Queen size, $30.00 for King. 15. How much can I fit in one Machine? We have our high extract front load washers in several different sizes. They can handle two, four, six or eight loads of laundry depending on your needs. This washer is not good for bedding, towels or anything heavy. We then have our front-load washers in several different sizes. They handle two, four, six and eight loads of wash all in one machine. 16. Can I wash bedding or rugs in the machines? Sure our machines are made for large items. Please let our attendant know if you are washing a shaggy rug so we can check the drains afterwards. You should not wash rugs with rubber backing as they may shred during the wash. The great thing is that you can ask one of our trained people as to what machine is best for you to use. 17. When is an attendant present? From the time we open the store until the time we close the store. We attend our stores all the time to make sure the laundry is safe, clean and that they can help you with any of your laundry questions. 18. Do you really dry in one cycle or does it take 2 or 3 cycles to dry? To best use a dryer you should never overload it, as this will decrease the airflow within the pocket. It is the airflow and tumbling action that dries your clothes. An overloaded dryer will also result in more creasing to your clothes. Our dryers are HOT; we keep them set high for our hot cycle so you may be done with laundry as quick as possible! When our hot dryers are combined with the fast extract from our front-load washers you can expect a very quick dry. How long it takes to dry will depend on what clothing and how much are in them. 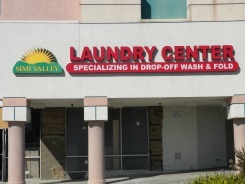 Simi Valley has three sizes of dryers one can hold up to 30 lbs of clothing and our largest dryers can hold up to 45 lbs and 75lbs of clothing. An average load of clothing should be dry in two cycles. 19. What if a machine breaks during my usage? That is why we provide an attendant on site. Our attendant will be glad to restart a new machine for you if your machine does not perform up to your standards. 20. Do you sell merchandise in case I forgot my detergent, etc? We sell both vending and regular size laundry products such as Tide, Downy, Bounce, and Clorox. We even have laundry bags to carry your clothing in with our Simi Valley Laundry logo.. Just ask our attendant and they will be glad to help you find the product best suited for your laundry needs.